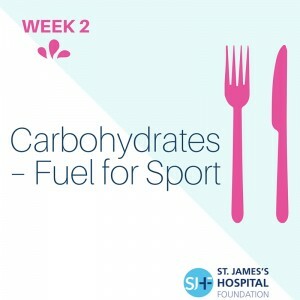 In the coming weeks, we will focus on some dietary changes to help us achieve our goals on the day of the mini-marathon, starting with carbohydrates. Carbohydrates are the main source of energy in our diets and therefore the main fuel source for exercise. Carbohydrate is stored in the body as glycogen. During exercise glycogen is broken down into glucose to supply the working muscles with energy. If you do not eat enough carbohydrate-rich foods your glycogen stores will be inadequate. This can lead to earlier onset of fatigue and may affect your performance. However, too much carbohydrate may lead to weight gain. 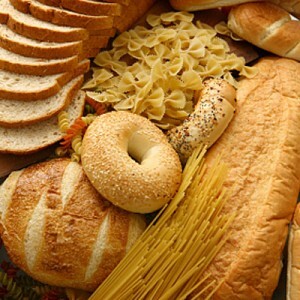 There are two main types of carbohydrates: starchy carbohydrates (high fibre or low fibre) and sugary carbohydrates. High fibre starchy carbohydrates (wholegrains) are a crucial component of a healthy diet and are essential for bowel health. Starchy carbohydrates are the best source of fuel for exercise, as they not only provide carbohydrate but also other nutrients essential for health. How much carbohydrate is needed? The amount of carbohydrate that is needed depends on the length and intensity of exercise (i.e. if you decide to walk or run the race). The greater the length and intensity of exercise, the more carbohydrates are needed to fuel working muscles. Eat a carbohydrate-rich meal 3-4 hours before exercising. This will top up glycogen stores in the liver and muscle and reduce fatigue while exercising. Ensure this meal is also low in fat and not too high in fibre, as this will reduce the risk of getting stomach cramps during exercising. Try not to experiment with different foods on race day; instead choose foods that you regularly eat and know will not upset your stomach. Aim to eat a snack containing carbohydrate and some protein in the 30 minutes following the race, as glycogen stores will be topped up quickly during this time. Next time we will focus on hydration and the importance of adequate fluid throughout your training.